George Zimmerman trial: Eric Holder's DOJ isn't "race-baiting" the Trayvon Martin case. 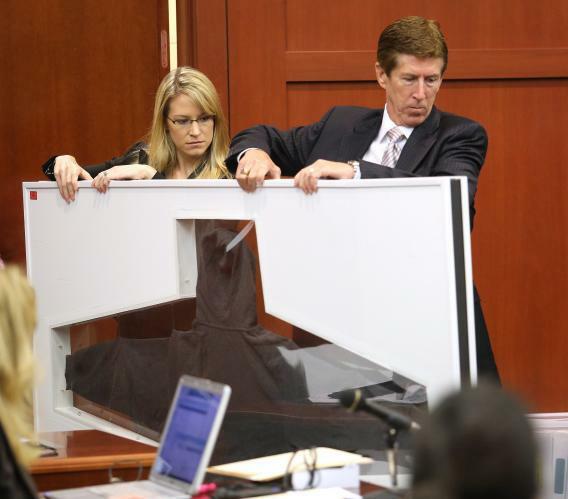 Defense counsel Mark O’Mara and an assistant carry in Trayvon Martin’s hoodie in the George Zimmerman trial in Sanford, Fla., on July 9, 2013. My new piece explains the origins of the best kind of scandal—the one where people interpret public record facts as proof of something darker and unknown. The Community Relations Service, a $12 million bureau of the Department of Justice, shuttles into situations where there might come a racial contretemps. It arrived in Sanford and Miami as the Trayvon Martin protests started to build. This, according to conservatives who’ve FOIA’d the bills from the CRS’s work, is evidence a rogue DOJ “race-baiting” in order to break the justice system. Right now the most dedicated critic in what Stranahan calls “Trayvongate” is J. Christian Adams. In 2005 Adams was hired by the Bush administration’s Department of Justice. In 2008 Adams built the DOJ’s case against the very black supremacist, very fringe New Black Panther Party, after two of its members had skulked outside a polling place brandishing nightsticks. (One signal of their strategic intelligence: The polling place they chose was overwhelmingly black and Democratic.) When the Obama administration didn’t pursue the case, Adams quit and started writing and speaking about the racial “politicization” of Eric Holder’s Justice Department. We had grown up in a state and environment where race is a way of life … We’re not from Sanford, but what Sanford represented to us was the very real problems going around this state and this country. We wanted to figure out how could we stand in solidarity, and how could we make this about not just justice for Trayvon, but using this moment and using the opportunity to honor his memory, to honor his spirit by working to bring down the various structures and the various systems that allow something like this to happen. If you disagree with the sentiment, you think the DOJ has given in to racism.